Whether you’re four years old, 14 years old, or 40 years old, you’ll need to practice proper oral care if you want your teeth to last. This is not a difficult task to accomplish though, according to your dentist in Carrollton. By staying diligent and having the right tools at your disposal, your entire family can fight back against dental plaque and bacteria that just loves to eat the foods you eat, converting them into acid. Every at-home oral health routine can be separated into three basic categories: brushing, flossing, and diet. Once you’ve got these habits perfected, your dentist will be proud to say you are free of any and all dental disease and cavities. When it comes to brushing, you need to have a toothbrush that fits your hand and your mouth. If you can’t brush comfortably, you’ll be far less inclined to commit to the habit. That means if you’re buying a toothbrush for your young ones, make sure the bristles are soft, the handles are easy to hold, and the head isn’t too big for their tiny mouths. The ADA as well as your dentist in Carrollton recommends that the average adult and child brush twice a day for at least two minutes using a fluoridated toothpaste. Typically, your dentist tells you to brush in the morning and at night, but what really matters is that you do it twice a day. Be sure to use circular motions on the surface of your teeth, then switch to a back forth motion on the top and sides of your teeth holding the brush at a 45-degree angle. Don’t forget the backs of your teeth and remember to brush excess bacteria off your tongue. Many people still do not floss regularly often because they find it too difficult or cumbersome. However, flossing works to remove an additional 40 percent of dental plaque from the sides of teeth, so it is necessary for your routine. Use waxed floss as this is less likely to tear while in use. Pull out at least 12 to 18 inches so you have enough to wrap around your fingers. Carefully slide the floss in between your teeth and avoid snapping the floss or applying too much pressure. If you struggle while flossing, use floss picks or a floss holder to make it easier. The best thing you can do for your teeth besides cleaning them everyday is to watch the foods you eat. Sugary or starchy foods can easily get stuck in the many cracks and crevices of your teeth and produce plaque, so be sure to replace or supplement those foods with healthy, crunchy foods that stimulate saliva production. This includes apples, celery, carrots, and other vegetables high in water content. Also, be sure to regularly have a balanced meal as this works better to stimulate saliva flow and protect your teeth. Snacks throughout the day are far less capable of keeping your mouth moist, so be sure to include vegetables, grains, and starches balanced during your three daily meals. Need more advice for a better oral health routine? 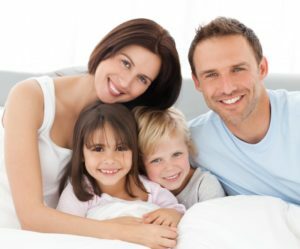 Schedule an appointment with your children’s dentist in Carrollton to learn more! Dr. Rajiv Shekhadiya always strives to provide patients with high quality dental care. His highest priority involves making them feel comfortable, relaxed, and informed when ever they come to visit. He recommends that they come by every 6 months for exams and cleanings as part of their oral health routine. To learn more about his preventive treatments and practice, contact him at (469) 892-6647 or visit his website.